Child Rights Foundation is a child-focused NGO in Cambodia that works to empower, support and mobilise children, young people & adults to implement and maintain the UN Convention on the Rights of the Child. In particular, the organisation is focusing on the fundamental rights of children to health and access to health services, quality education, protection from all forms of violence and harm, and rights to participate as a citizen. 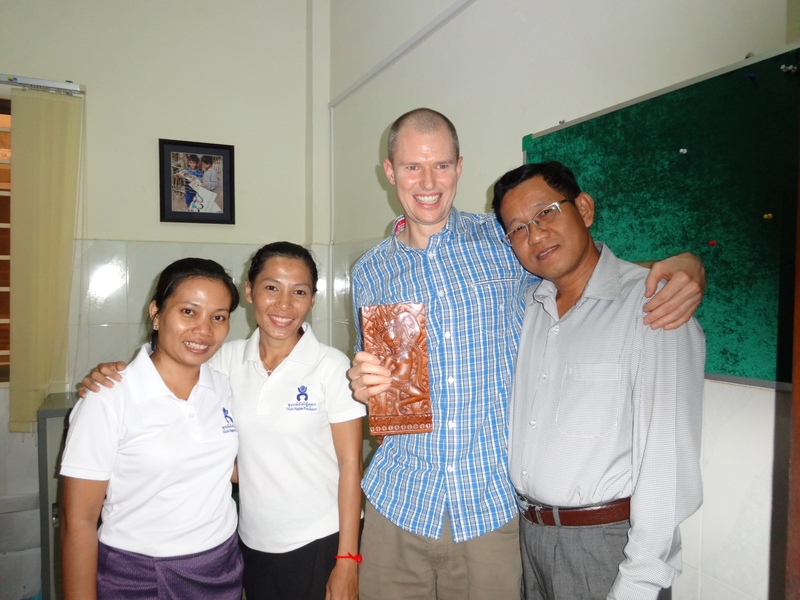 Michael Dunnett recently spent four weeks volunteering with the Child Rights Foundation (CRF) in Cambodia. Michael worked to strengthen the organisation's financial management, and identify effective ways to help staff cope with both their workloads and reporting requirements. Where were you working before the placement? I have been employed by McGrathNicol, an Australian Chartered Accounting firm, for the past 10 years. My work primarily consists of providing financial consulting services to the Australian government, including financial modelling, fraud investigation, financial viability analysis, governance, and management accounting. I had the opportunity to take a short career break. What made you decide to take up a volunteer placement? One of my colleagues recently conducted a volunteer assignment with the Red Cross, and was very positive about the experience. I have been interested in volunteering and trying to give a little bit back for a number of years. I thought I could add more value volunteering in an accounting capacity than I could doing manual labour! As a result I was attracted to volunteering through AfID. Did you have any particular concerns before you left? My major concern was whether I would be able to genuinely help the organisation. Upon meeting with CRF’s accounting team I admit I did become increasingly concerned, as CRF have a very capable team. However, I was able to identify and undertake a number of tasks that CRF’s accounting staff did not have time for, and I was able to provide an independent review of their accounting and governance policies that identified areas where they could further improve practices. Also, a key outcome of my placement was to provide reassurance that CRF’s finance and governance practices are generally sound, and that they are efficiently meeting the reporting requirements of their donors. How did your skills and experience help you on your placement? I have experience providing accounting and finance advice to organisations that receive government funding and donor funding, which was helpful as reporting expenditure of donor funding is of vital importance to CRF. The scope of my role was not clear until I had the chance to sit down with the CEO and Finance Manager. As it turned out, whilst I hadn’t done a lot of internal audit, those skills were helpful in conducting a review of CRF’s policies and compliance with those policies. Also, simply my experience with working with people and obtaining information was helpful for the role. What was the most rewarding moment during the placement? The most rewarding aspect of the placement was CRF’s appreciation of the process maps I created for a number of CRF’s finance practices. The process maps will help non Finance staff understand their requirements when conducting work activities such as purchasing goods and services and undertaking staff travel. I also was delighted to help the CEO by proof reading a response in English to a potential donor. What was your best experience outside of the office? On a Sunday, a number of CRF staff took me out for the day. We went to a spot on the river not far out Phnom Penh, and played cards for 100 riel a hand (about 2 cents), had a Cambodian style lunch then went for 2 hours of karaoke! Has your placement changed your outlook on your working or personal life? My experience has definitely changed my outlook. The ability of the Cambodian staff to work hard and stay so positive and supportive of each other was impressive. In comparison to Australia, Cambodian finance staff are not well paid, and their standard of living is far lower, but they were very happy people. Would you recommend an AfID volunteer placement to others? Yes I would highly recommend an AFiD volunteer placement to others.